In recent years the average level of pay increases for staff at all levels has been constrained, with the after-effects of the Global Financial Crisis (GFC) proving difficult to dismiss. Initial results from our March 2017 survey results suggest this may be changing slowly, with average increases for both Top Executive staff and General Staff lifting slightly compared to recent years. The average increase in Base Salary measures the level of increase for staff who have been in the same role for the full twelve month period covered by the survey. For Top Executive staff this has risen to 3.7 percent at 1 March 2017, compared to 3.4 percent in the twelve months ending September 2016. That rise is significant, lifting the figure to the highest level recorded since the GFC. For General Staff the lift in the level of increase is also significant, rising to 3.6 percent in March 2017 compared to 3.3 percent in September 2016. Again, this is the highest level recorded since the GFC. There has been widespread talk over the past year or so of New Zealand’s “Rockstar economy”, but any sign of that flowing through into increased pay levels has proved somewhat nebulous. These higher increases point to the possibility that while any flow-through effect from improving economic conditions may take time, it does come eventually. Of course, increases in Base Salary are not the only factor to be considered. While such increases do impact on the overall market value of jobs, changes in that underlying value are also influenced by other factors, the most significant of which is the pay rate offered to new appointees. Historically, when an employee leaves a role, and is replaced, the new appointee is typically offered a package which is lower than that received by the previous employee. This is not altogether surprising, as in the majority of cases there needs to be time for the new appointee to develop into the role, before the expected level of contribution is delivered. Whatever the reason however, these lower starting rates for new appointees moderate the impact of pay increases for existing staff, and generally result in the movement in value for all roles being lower than that measured by pay increases alone. For example, while the average increase in Base Salary for Top Executives was recorded at 3.7 percent at 1 March 2017 (as commented on above), the change in the Median value (i.e. the middle of the range of all payments) for the Top Executive group nationally was just 1.2 percent. 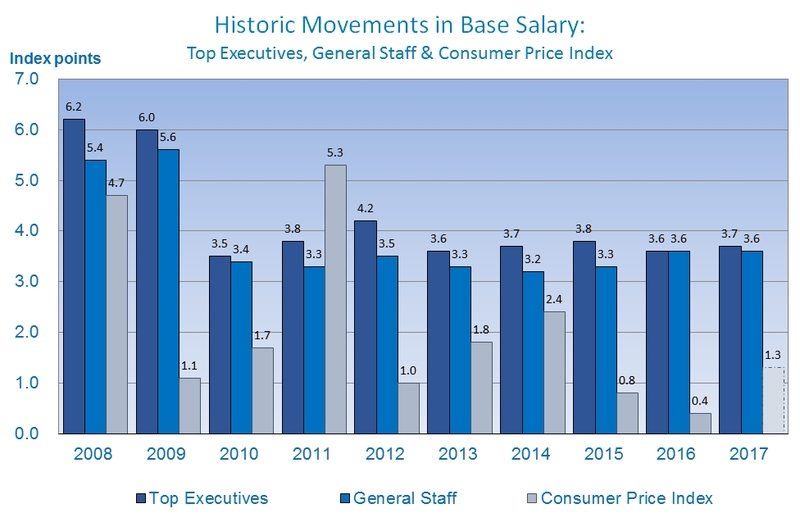 A similar picture emerges for General Staff, with the movement in Median value being just 1.0 percent nationally, compared to the Base Salary movement of 3.6 percent. 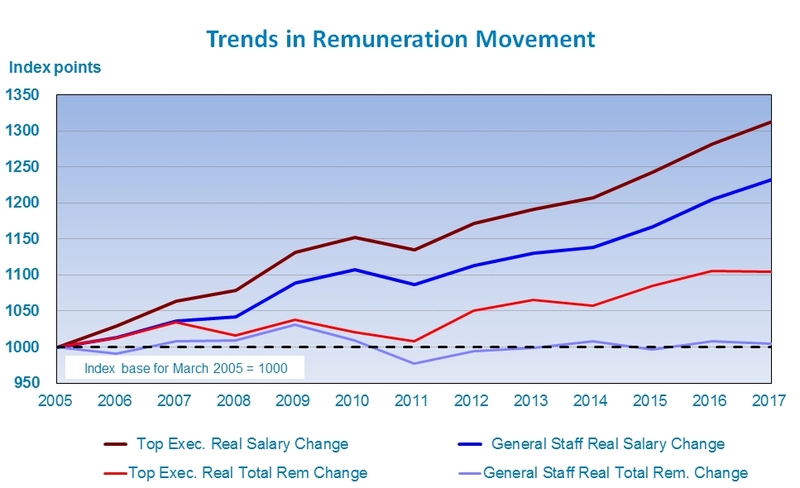 As the chart shows, adjusting pay structures based on the Average Base Salary movement figure creates a serious risk of over-stating the value of the roles themselves, as changes in the value of jobs has proved much slower. Far better to adjust pay structures by figures based on the Median Movement figure (i.e. 1.2 percent or 1.0 percent for Top Executives and General Staff respectively), while also making provision for higher adjustments for individual staff who continue to deliver to – and above – expectations. Prior to the GFC generous Bonus payments were also feature of pay structures, particularly for Top Executive roles, although it was also recognised that New Zealand payment levels were well behind those in other western economies. Not surprisingly the level of payments – along with the proportion of staff receiving them – dropped during 2010 and 2011. 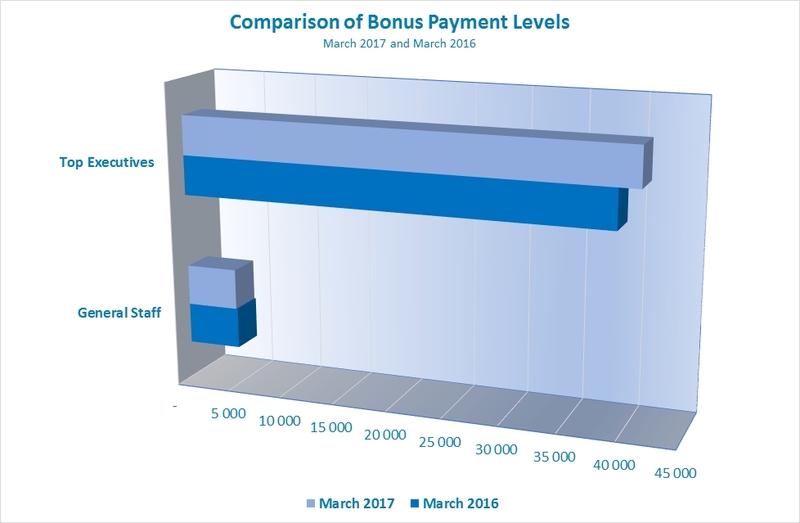 The March 2017 survey shows that these payments are still to recover, with both Top Executive Bonus payments and General Staff payments showing only minimal change since March 2016. Analysis of the results and longer term trends is continuing. We will update this post once that process is completed. If you wish to find out more about these results, or the MHR RemData service please complete our enquiry form.